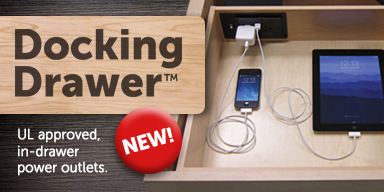 In Drawer Power Outlets - Spokane Hardware Supply, Inc.
It’s time to clear clutter one drawer at a time with Docking Drawer in-drawer power outlets. Whether it’s in your home, closet, office or locker room, reduce clutter by getting all your cords, chargers, personal technology and hair dryers out of the way with simple to specify Docking Drawer in-drawer power outlets solutions. Docking Drawers are purpose built, easy to install and UL 962a and CSA-C22.2 approved to offer safe, trouble free operation while meeting building codes.